Chamique Holdsclaw speaks at Belmont University Nashville, Tennessee, February 16, 2018. 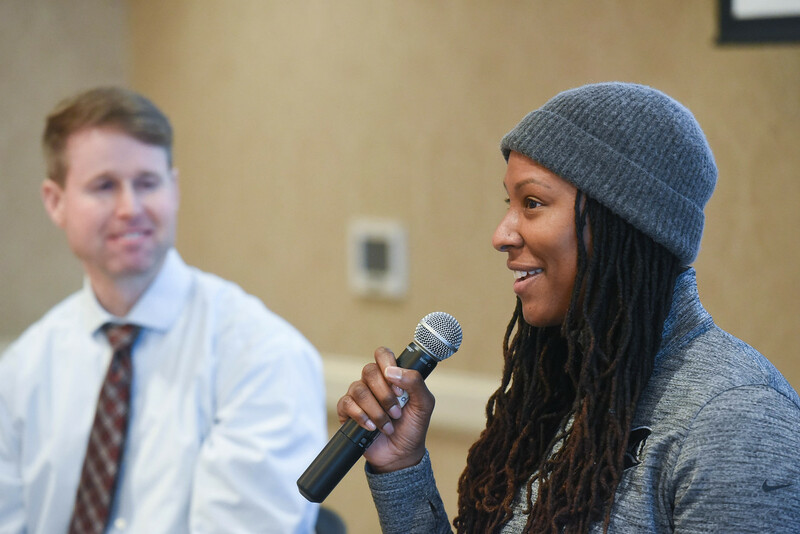 Gold-medal winning Olympian and former WNBA player Chamique Holdsclaw visited campus last week, speaking to students in a convo co-sponsored with Athletics and the Counseling Center and participating in a luncheon focused on women in sports. The University of Tennessee graduate and former Lady Vol discussed her journey from a broken home to basketball super-stardom, offering insights on her struggles with mental illness and often-difficult path to recovery. Following her parents’ separation, Holdsclaw grew up in New York City and was raised by her grandmother in the inner city. Though she was teased for being the only girl playing with the boys, Holdsclaw embraced basketball as an outlet and began attracting the attention of college coaches and recruiters. The close relationship Holdsclaw held with Summit, who died in 2016, was evident throughout her remarks, particularly as she recounted her personal difficulties and the constant wise presence her coach consistently offered. Still, she realized in college that the depression and anxiety that first arose in her as a child was becoming a problem beyond what she could manage on her own. Though it took years–and many wrong steps along the way–Holdsclaw has now been correctly diagnosed and treated for bipolar disorder. Her recovery is ongoing, and it’s led her to a new career as a passionate advocate for others battling the same issues. She now openly and discusses her journey, despite frequent pressure to return to the game as a coach or broadcaster. Holdsclaw will be inducted into the Women’s Basketball Hall of Fame in June. Holdsclaw was in Nashville to do a screening of her documentary, “Mind/Game: The Unquiet Journey of Chamique Holdsclaw,” followed by discussion and Q&A as part of the 2018 Play Like a Girl Summit, which was held on Belmont’s campus. Since 2004, Play Like a Girl has built a network of clubs and events that has served more than 100,000 girls nationwide. The organization seeks to help girls aged 9-13 find the courage to do things beyond the field of play that they never thought they could. Play Like a Girl operates on the belief that when girls are given the opportunity to play on a team, they become women who have the confidence to stand on their own.